How to watch Pacquiao vs. Mayweather: Live stream online, PPV, free TV, public viewing, start time and fight details - Balita Boss! The biggest fight of the decade, Floyd Mayweather vs. Manny Pacquiao is set on May 2, 2015 at the MGM Grand Arena in Las Vegas. For the first time since Mike Tyson fought Lennox Lewis for the heavyweight title in 2002, Showtime and HBO, the two pay cable networks will do a joint broadcast of the mega-fight between Mayweather and Pacquiao. It's expensive to go to Las Vegas just to watch the "Fight of the Century" live. All tickets made available online were sold out on the day they were released on sale. So, how can you watch the big event on pay-per-view, TV, public viewing or live online? According to reports of ESPN’s Darren Rovell, the suggested retail price of PPV in the US for the fight of the two greatest fighters of this generation, Floyd Mayweather and Manny Pacquiao, is $89.95. An additional charge for HD viewing could be as much as $10. In the Philippines, to watch the PPV, which, of course, features the Floyd Mayweather Jr. vs. Manny Pacquiao fight in the main event, dubbed as the "Battle for Greatness," you can subscribe to SKYCable for ₱ 2500 or to Cignal Digital TV for ₱ 2000 (Regular rate of P2,500 applies to subscriptions after April 18). To know more about SKYcable and Cignal, log on to mysky.com.ph and cignal.tv. PLDT, the largest telecommunications company in the Philippines, has also offered to watch the Pacquiao vs. Mayweather in HD via pay-per-view for free if you subscribe to Triple Play Plan until April 24. Please click here for details. Boxing fans can also watch the superfight between Mayweather and Pacquiao live on Android devices via Viewstream app. Smart has made available the Viewstream app for live and ad-free stream of the fight for just ₱ 499. Smart, Sun Cellular, and Talk ‘N Text subscribers can pay to view the livestream using their prepaid loads or charge the fee to their postpaid accounts. Please click here for details. 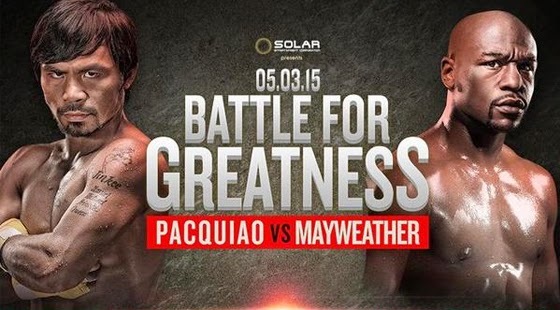 On free TV, GMA-7, ABS-CBN, and TV5 will air the fight between Mayweather and Pacquiao on a slightly-delayed basis. Online viewers can watch ABS-CBN live stream on iwantv.com.ph and TV5 live stream on sports5.ph. The three TV network will air the fight simultaneously on free TV starting at 10 a.m. Sports5.ph has a replay of the main event at 4 p.m. Here's a list of venues where you can watch the Pacquiao-Mayweather fight free in Metro Manila. Makati Coliseum in Barangay La Paz - open starting 7 am; 1,000 tickets to be given to senior citizens and persons with disabilities for priority seating. First come, first served seating for viewers without tickets. In province, here's a list of venues for public viewing of Pacquiao-Mayweather: Battle for Greatness. The fight that everybody has been waiting for years is now a reality. Watch as two of boxing's greats, undefeated Floyd Mayweather Jr. and eight division world champion Manny Pacquiao battle it out and settle the score once and for all on May 3 from the MGM Grand Arena in Las Vegans, Nevada.